Samsung started taking wireless charging seriously with the Galaxy S6 and Galaxy S6 edge, following which every new flagship from the Korean giant has come with wireless charging support. The company released an official wireless charger to go along with the S6 lineup; Samsung then upped the game with the Galaxy Note 5 and Galaxy S6 edge+, which introduced support for fast wireless charging. The Galaxy S7 and Galaxy S7 edge followed suit and were accompanied by Samsung’s new standing wireless charger. Now, Samsung is finally combining both its pad and standing wireless charger into one. 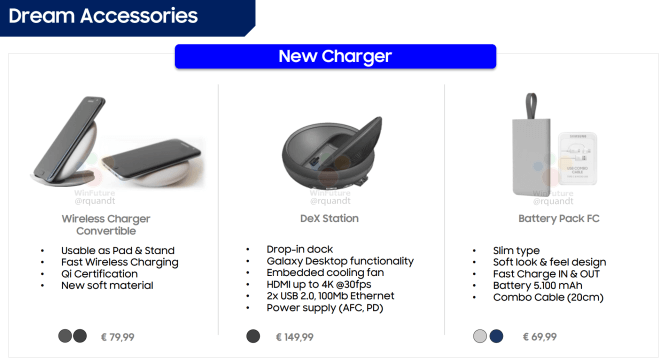 A new leak has revealed Samsung’s new convertible wireless charger, which will turn into a pad or a stand depending on how you like your wireless charger. It’s a neat idea, one that Samsung could have implemented earlier. But better late than never as they say, so I can’t wait to get my hands on the new wireless charger (that will launch with the Galaxy S8). It’s expected to be slightly costlier than last year’s wireless charging stand, but that shouldn’t deter most folks who prefer wireless charging to messing around with wires all the time. Of course, most folks will likely prefer using it in stand mode as that makes using the device while it’s charging a whole lot easier compared to a charging pad, but it’s great to see Samsung will be keeping both camps happy with the new model. What do you make of Samsung’s new convertible wireless charger? A little late with that Samsung. I already got the Fast Charging Wireless stand. And the regular wireless pad, which I got for free. No need for another. Oh finally I have been waiting for a true Wireless charging Pad without using a USB cable!! Totally useless, as only reason to buy this is that Samsung is finally combining both its pad and standing wireless charger into one. i think i will stick with the s7 wireless charger pad,i dont think this will add nothing new,except changing the position.